Sheriff’s officers arrested two city men driving in stolen vehicle by the Haledon Avenue bridge with three teenage girls in the backseat on Friday morning, according to Passaic County Sheriff Richard Berdnik. 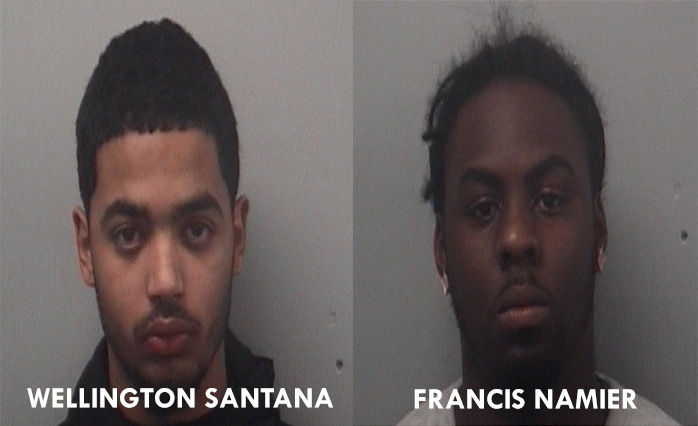 Francis Namier, 22, and Wellington Santana, 19, were inside a gray 2015 Nissan Sentra stolen from an elderly woman in Hope Township when sheriff’s officers in the area received alert of a stolen vehicle nearby. Officers Joseph Parlegreco and Antonio Manente initiated a motor vehicle stop at around 9:09 a.m. on Straight and Lafayette streets. Namier stopped the car in the parking lot of Dawa Food Mart. Sheriff’s officers approached the car. Officers observed Namier in the driver’s seat, Santana in the front passenger seat, and three girls in the backseat. Santana told the officers the vehicle belonged to him and it was not stolen. Officers discovered the real owner of the car was a 75-year-old woman of Hope Township. Authorities determined the 16-year-old girls had no knowledge the car was stolen. Three of them were released to their parents while Namier and Santana were arrested. Namier, who lives on North 6th Street, was charged with marijuana possession and receiving stolen property. Santana, who lives on Jefferson Street, was charged with unlawful taking of means of conveyance for being a passenger in a stolen car. Namier and Santana were processed and released pending a court appearance on January 16, 2017 at the Passaic County Superior Court, authorities said.